We're delighted to announce that the range of instruments in our flagship Admiral.Markets account1 is being expanded! 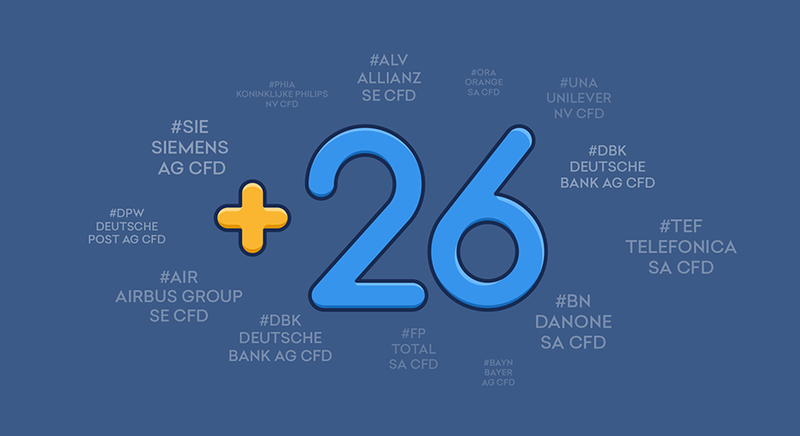 We now offer 26 new CFDs on the most actively traded European shares which constitute the Euro STOXX 50 index. Get new trading and investment opportunities with the most popular bluechips of the developed European countries. Buy or sell share CFDs without any short sale restrictions. Accurately manage your portfolio with our flexible contract sizes starting from as low as 1 share CFD. Get dividend adjustments if you hold a long CFD position when the underlying share goes ex-dividend2. Save more with our commissions, which are among the lowest on the market. Commission – 0.05% of the transaction's notional value3. Minimum commission – 3 EUR per transaction. Lot size, minimum contract size and increment – 1 share. Maximum contract size – 10,000 lots. Leverage – 1:10 (i.e. margin rate of 10%). Tick size and minimum spread – 0.001 EUR. Of course, this isn't all we have to offer — it's just the beginning! Equipped with the latest technologies and solutions, we're eager to offer you many more CFDs and improve the terms of our existing ones. If you're interested in CFDs, don't forget, Admiral Markets also has other great index offers, such as our current best-seller, the DAX30 - with a typical spread of only 0.8 points during the main trading hours! Always keep up to date with our news and stay updated on all of our developments. Good luck in your trading! New instruments are only available to Admiral.Markets accounts on AM-Live2 trading server. Traders with Admiral.Markets (ex-Pro) accounts on the AM-Live1 and AM-Live3 servers can get access to new instruments by opening a new Admiral.Markets account and transferring funds internally via their Trader's Room. Dividend adjustments are credited to accounts with long share CFD positions (Buy) and debited from accounts with short share CFD positions (Sell). Commission and minimum commission values are indicated per transaction (i.e. per side). Commission is charged in the full amount (i.e. per side value x 2) upon opening a share CFD position. Minimum commission is charged whenever the mathematical value of the commission is below the minimum level of 3 EUR. You may need to right-click on 'Market Watch' and select the 'Show All' option to display the new instruments in your MetaTrader 4 terminal. As ever, should you have any questions, please do not hesitate to contact your account manager or our Customer Support service.